Thirty-three Latin American leaders have come together and formed a new regional bloc, pledging closer economic and political ties. The Community of Latin American and Caribbean States (CELAC) pointedly excludes the US and Canada. On the second day of a summit in the Venezuelan capital, Caracas, all Latin American leaders, both right and left, officially signed into effect the formation of the CELAC bloc. The foundation of the bloc has been praised as the realization of the two-centuries-old idea of Latin American “independence” envisioned by Simon Bolivar. Analysts view CELAC as an alternative to the Washington-based Organization of American States (OAS) and as an attempt by Latin American countries to reduce US influence in the region. “As the years go by, CELAC is going to leave behind the old and worn-out OAS,” Venezuelan President Hugo Chavez said at the inauguration of the bloc on Friday. “It’s the death sentence for the Monroe Doctrine,” said Nicaragua’s President Daniel Ortega said. Political analyst Omar Jose Hassan Farinas told RT’s Spanish channel the US views CELAC as a potential threat to its hegemony in the region. Chavez also read out statement opposing the US trade embargo on Cuba. Havana, which is not a member of the OAS, has joined the new regional bloc. “No more interference. Enough is enough! We have to take shape as a center of the world power and demand respect for all of us as community and for each one of our countries,” Venezuelan leader said. The 33 leaders pledged to withstand the financial crisis that has struck Europe and other developed countries. Brazil’s Dilma Rousseff stressed that the Latin American countries would need to rely more on their neighbors amid the global economic turmoil. Chilean President Sebastian Pinera, who assumed the initial rotating presidency at CELAC, expressed hopes that the bloc would help build regional cooperation despite the differences between some of the 33 member states. The leaders also discussed cooperation in the field of drug trafficking and climate change. CELAC should be a “political union to build a large power center of the 21st century,” the Venezuelan president said, stressing strong regional growth as many countries in the region develop closer ties with Asia or Europe and reduce their traditional reliance on the US. The formation of CELAC was warmly welcomed by rising global power, China. 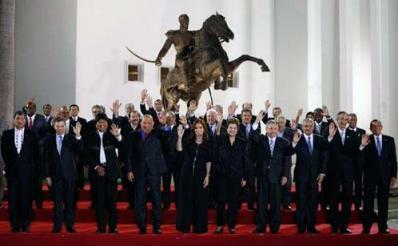 Chavez read aloud a letter from Chinese President Hu Jintao congratulating the leaders on forming the new bloc. Hu pledged to deepen cooperation with the CELAC and underlined that in the 21st century the relations between China and Latin America have seen all-round and fast development with expansion of mutually beneficial cooperation, according to Xinhua news agency. The countries of CELAC have a combined population of nearly 600 million people, and a combined GDP of about US$6 trillion – about a third of the combined output of the US and Canada.